The latest reviewed version was checked on 13 January 2019. There is 1 pending change awaiting review. Creates a cube in the first octant. When center is true, the cube is centered on the origin. Argument names are optional if given in the order shown here. 3 value array [x,y,z], cube with dimensions x, y and z. Creates a sphere at the origin of the coordinate system. The r argument name is optional. To use d instead of r, d must be named. Diameter. This is the diameter of the sphere. Creates a cylinder or cone centered about the z axis. When center is true, it is also centered vertically along the z axis. Parameter names are optional if given in the order shown here. If a parameter is named, all following parameters must also be named. NOTE: If r, d, d1 or d2 are used they must be named. r : radius of cylinder. r1 = r2 = r.
r1 : radius, bottom of cone. r2 : radius, top of cone. d : diameter of cylinder. r1 = r2 = d /2. Larger values of $fn create smoother, more circular, surfaces at the cost of longer rendering time. Some use medium values during development for the faster rendering, then change to a larger value for the final F6 rendering. 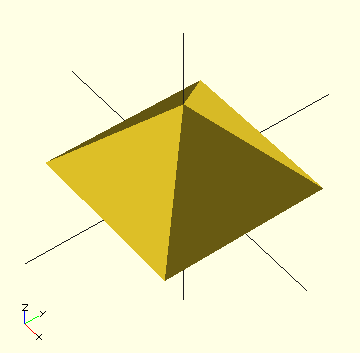 A polyhedron is the most general 3D primitive solid. 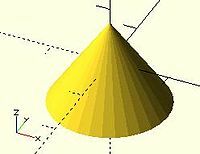 It can be used to create any regular or irregular shape including those with concave as well as convex features. 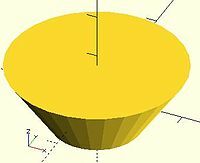 Curved surfaces are approximated by a series of flat surfaces. Vector of 3d points or vertices. Each point is in turn a vector, [x,y,z], of its coordinates. Points may be defined in any order. N points are referenced, in the order defined, as 0 to N-1. Vector of faces which collectively enclose the solid. Each face is a vector containing the indices (0 based) of 3 points from the points vector. Vector of faces which collectively enclose the solid. Each face is a vector containing the indices (0 based) of 3 or more points from the points vector. Faces may be defined in any order. Define enough faces to fully enclose the solid, with no overlap. Points which describe a single face must all be on the same plane. Integer. The convexity parameter specifies the maximum number of faces a ray intersecting the object might penetrate. This parameter is only needed for correctly displaying the object in OpenCSG preview mode. It has no effect on the polyhedron rendering. For display problems, setting it to 10 should work fine for most cases. All faces must have points ordered in the same direction . OpenSCAD prefers clockwise when looking at each face from outside inwards. The back is viewed from the back, the bottom from the bottom, etc..
exactly two faces should meet at any polyhedron edge. if two faces have a vertex in common, they should be in the same cycle face-edge around the vertex. 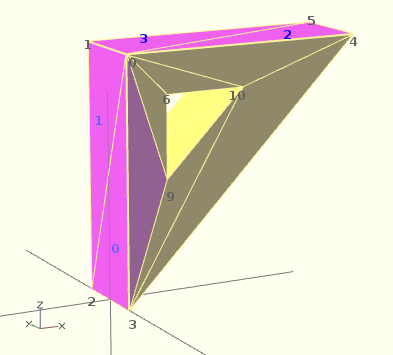 The first rule eliminates polyhedron like two cubes with a common edge and not watertight models; the second excludes polyhedron like two cubes with a common vertex. When viewed from the outside, the points describing each face must be in the same order . OpenSCAD prefers CW, and provides a mechanism for detecting CCW. When the thrown together view (F12) is used with F5, CCW faces are shown in pink. Reorder the points for incorrect faces. Rotate the object to view all faces. The pink view can be turned off with F10. OpenSCAD allows, temporarily, commenting out part of the face descriptions so that only the remaining faces are displayed. Use // to comment out the rest of the line. Use /* and */ to start and end a comment block. This can be part of a line or extend over several lines. Viewing only part of the faces can be helpful in determining the right points for an individual face. 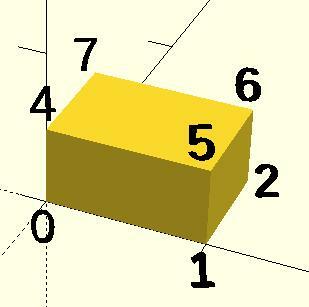 Note that a solid is not shown, only the faces. If using F12, all faces have one pink side. Commenting some faces helps also to show any internal face. After defining a polyhedron, its preview may seem correct. The polyhedron alone may even render fine. However to be sure it is a valid manifold and that it will generate a valid STL file, union it with any cube and render it (F6). If the polyhedron disappears, it means that it is not correct. Revise the winding order of all faces and the two rules stated above. Below you can see the code and the picture of such a problematic polyhedron, the bad polygons (faces or compositions of faces) are in pink. If you don't really understand "orientation", try to identify the mis-oriented pink faces and then invert the sequence of the references to the points vectors until you get it right. E.g. in the above example, the third triangle ([0,4,5]) was wrong and we fixed it as [4,0,5]. Remember that a face list is a circular list. In addition, you may select "Show Edges" from the "View Menu", print a screen capture and number both the points and the faces. In our example, the points are annotated in black and the faces in blue. Turn the object around and make a second copy from the back if needed. This way you can keep track. Orientation is determined by clockwise circular indexing. This means that if you're looking at the triangle (in this case [4,0,5]) from the outside you'll see that the path is clockwise around the center of the face. The winding order [4,0,5] is clockwise and therefore good. 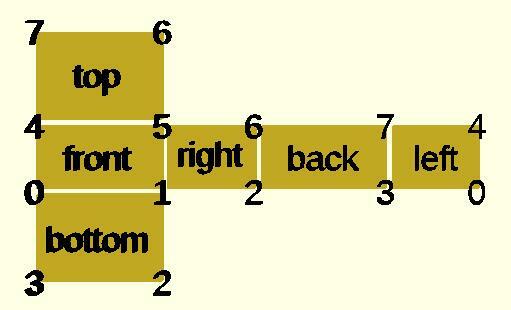 The winding order [0,4,5] is counter-clockwise and therefore bad. Likewise, any other clockwise order of [4,0,5] works: [5,4,0] & [0,5,4] are good too. If you use the clockwise technique, you'll always have your faces outside (outside of OpenSCAD, other programs do use counter-clockwise as the outside though). If you hold the face and the fingers of your right hand curls is the same order as the points, then your thumb points outwards. * Points define all of the points/vertices in the shape. * Faces is a list of flat polygons that connect up the points/vertices. Each point, in the point list, is defined with a 3-tuple x,y,z position specification. Points in the point list are automatically enumerated starting from zero for use in the faces list (0,1,2,3,... etc). Each face, in the faces list, is defined by selecting 3 or more of the points (using the point order number) out of the point list. e.g. faces=[ [0,1,2] ] defines a triangle from the first point (points are zero referenced) to the second point and then to the third point. When looking at any face from the outside, the face must list all points in a clockwise order. This page was last edited on 31 March 2019, at 02:30.